My father was killed in the early hours of April 27th 1942. This is what happened. 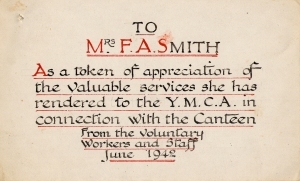 On April 25th 1942, the first night of the Blitz, my mother Mrs. Florence Smith was doing her voluntary duty at the Y.M.C.A. Forces Canteen, which she had organised in two small rooms in the premises in Broad Street since 1940. Although she had a home and family to look after she was always on the spot at the canteen early in the morning at 7.15 am to supervise the breakfasts for the men, and indeed often to cook meals entirely herself; then again at 10.00 am to arrange lunches, at 6.00 pm to supervise the cooked snacks for the evening and at 10.00 pm to go on duty for the helpers to clear up. It was then at the end of a very long day that the sirens sounded and this was followed immediately by a bomb falling nearby. The electricity failed and the Y.M.C.A. was plunged into darkness but being the person she was, she had prepared for this and produced a bundle of candles, which enabled all to see. Mrs. Smith then directed the members of the armed forces who were in the building to the safest area, which was the Billiard room. This duty fell to her as the night watchman had been forced to go to his family. Mrs. Smith had two daughters of her own. They had been left alone in the family's home in nearby Bladud's Buildings, as her husband was also on duty as a volunteer fireman doing the 8.00 pm to 8.00 am watch. Worried as to their safety she sent two Air Force men, who were friends of the family, around to get them down to the cellar where they always sheltered until the All Clear sounded. On the following night, Sunday April 26th, the sirens sounded for the second night running and Fireman Smith went to his usual post but unfortunately none of the other members of his crew reported for duty. As a result, it seems that he went to help out at the nearest fire which happened to be at the Assembly Rooms and just one of the many blazing throughout the city by now. There a Bristol Crew was hard pressed to bring it under control and he was sent to the Circus to man the pumps. Suddenly an unexploded bomb went off killing him outright. This picture ("Bath's Famous Circus is saved by the work of the Bomb Disposal Squad, 1942" by Norma Bull) is reproduced by kind permission of the Victoria Art Gallery, Bath & North East Somerset Council, who retain the copyright to it. 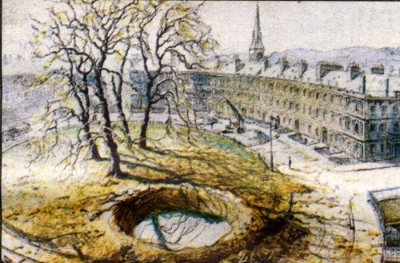 The crater in the foreground was caused by the bomb which killed Fireman Smith. For three days he was missing and his wife and two daughters suffered in agony awaiting some news. Finally the manager of his firm visited all of the mortuaries in an effort to discover his fate. Eventually he was identified by the fact that he had been wearing his fireman's uniform, just before he was due to be buried as an unknown casualty in the mass communal grave at Haycombe Cemetery. The Fire Service then organised a Ceremonial Funeral for him. This newspaper article is reproduced as it was printed. Notice that this is not quite what happened, but in the haste to meet its printing deadline the newspaper did not have the time to find out the exact story. Fireman Smith's family did find out exactly what happened, although it took a while to piece the story together. A bomb had fallen into the grass in the middle of the Circus, but it did not explode immediately and lay, buried in the soft earth, as an unexploded bomb. It was only a while later, perhaps disturbed by the vibration of the fire pumps, that it exploded. Unfortunately Fireman Smith was close by when that happened. - National Fire Services honours will be accorded to a Bath fire fighter -the only one killed - who laid down his life while in action during the second raid. He was Leonard Henry Smith, aged 49, a maintenance engineer. A part-time fireman he was one of the first to join the old A.F.S. and proved to be a keen and efficient member of the service. - He was at work with a crew on Sunday when a bomb fell near by and he was killed outright. Fireman Smith who was extremely popular among his colleagues, leaves a widow and three children. His son recently joined the Forces, and there are two daughters - Evelyn aged 18, and Doreen aged 13. When the funeral takes place at Haycombe on Tuesday afternoon a Fire Service Funeral will be accorded to a man who met a gallant death at the post of duty. Firemen's Last Tribute to Only Victim. - With a helmet resting on the Union Jack which covered the coffin, and 50 firemen marching behind Fire Force Commander J Cutts (No. 17 Area) and Divisional Officer James Hurst, Fireman L. Smith, only N.F.S. man to be killed on duty during the Bath raids was borne on a fire tender to his grave at Haycombe Cemetery on Tuesday. Fireman Smith was one of the first to join the A.F.S. as a part-time volunteer before the war. In civilian life he was motor maintenance engineer to Norton Dairies. After my father's death my mother was forced to resign her voluntary work. Those who had worked with her presented her with a farewell card. Tragically during the next raid, his assistant at Norton Dairies, Allan Woods, who was in the Home Guards, was killed while fire watching. This must have brought absolute disorder to the department. This story illustrates a problem that many faced, of finding out what happened to a friend or relative that failed to arrive back home after the bombing, either because they had been killed or because they survived but could not return home. Note the similarity between the search for Fireman Smith and what happened to Mr Bamford. 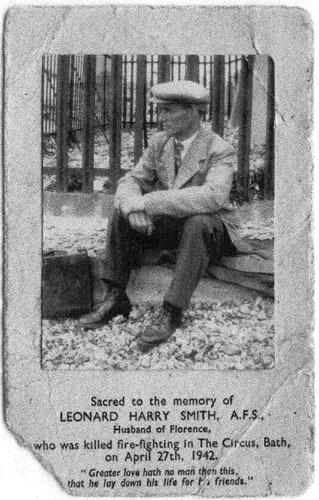 Fireman Smith had the dubious honour of being the only firefighter killed while on duty during the blitz. Another firefighter, William Peschel survived and was able to tell his story as a first hand experience.